Work with the color property. 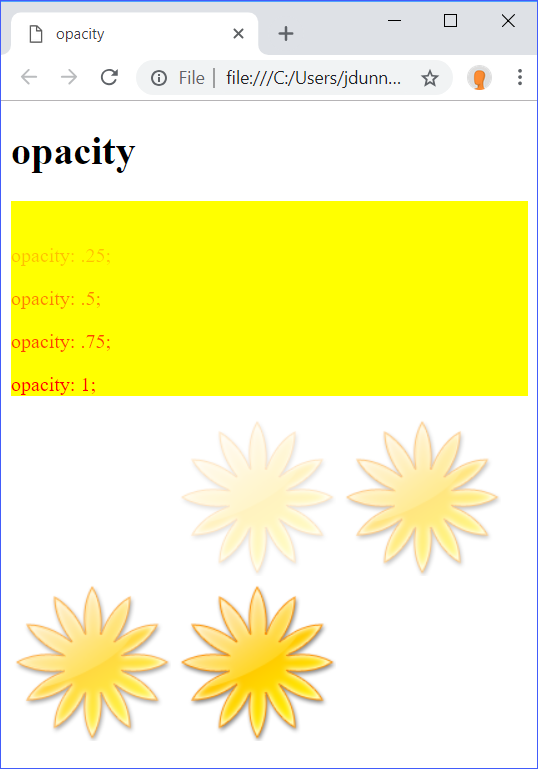 Work with the opacity property. CSS makes it really easy to add color to your HTML pages. Almost every element can have color added to it, and CSS provides multiple methods to do so. For a comprehensive list of things in CSS that can have color, see Mozilla's list of Things that can have color (https://developer.mozilla.org/en-US/docs/Web/HTML/Applying_color#Things_that_can_have_color). The opacity of an element is how transparent it is. Everything that can be colored, can also have its opacity changed, and opacity can additionally affect images, which colors do not affect. Opacity and color go hand in hand, and there are several ways to apply color and opacity at the same time. There are two main color models used to create colors in CSS. The first is the RGB (Red/Green/Blue) color model, which combines red, green, and blue in different amounts to create a wide range of colors. The second is the HSL (Hue/Saturation/Lightness) color model, which creates colors based on hue, lightness, and saturation. RGB is more popular and more commonly used, but HSL is a much more intuitive system. 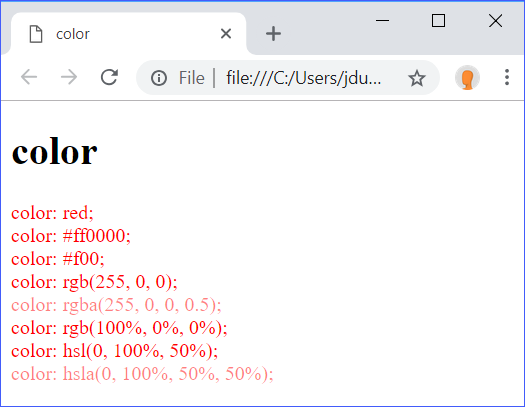 If you want to play around with different RGB and HSL colors, check out Mozilla's Color picker tool (https://developer.mozilla.org/en-US/docs/Web/CSS/CSS_Colors/Color_picker_tool. Opacity is most commonly expressed as a percentage from 0% (invisible) to 100% (opaque), and/or a number from 0.0 (invisible) to 1.0 (opaque). CSS recognizes over a hundred color keywords as acceptable color values ranging from white to honeydew. For a full list of accepted color keywords see Mozilla's List of color keywords (https://developer.mozilla.org/en-US/docs/Web/CSS/color_value#Color_keywords. In shorthand hexadecimal notation, the six digits are cut down to three, and each digit represents two of itself. For example, #f03 would be #ff0033. Hue - An angle of the color circle in degrees (deg), radians (rad), gradians (grad), or turns (turn). If units are omitted, deg are assumed. Saturation - A percentage where 100% is completely saturated (full color) and 0% is a shade of gray. Lightness - A percentage where 100% is white, 50% is "normal" lightness, and 0% is black. Both RGB and HSL functional notations have ways to specify opacity (alpha) at the same time as color. Along with their respective normal notations (rgb() and hsl()), they also have alpha notations (rgba() and hsla()) that accept a fourth parameter (alpha), which is expressed either as a percentage from 0% to 100% or a number between 0.0 and 1.0. These are both well-supported in modern browsers, and are a good way to specify opacity in CSS. In some modern browsers, the rgb() and rgba() notations are interchangeable, meaning that rgb() can also take the alpha parameter, but this is not well-supported. In this demo, opacity was also used to change the transparency of images. This is something that the color property cannot do as images are not affected by the color property. In this exercise, you will add color and opacity properties to an HTML file containing three children's stories. Open Exercises/stories.html in your editor. Create a CSS file called stories-styles.css and link to it from stories.html. Using CSS, edit the color and opacity of the different elements in stories.html. The object of this exercise is to practice using the color and opacity properties. 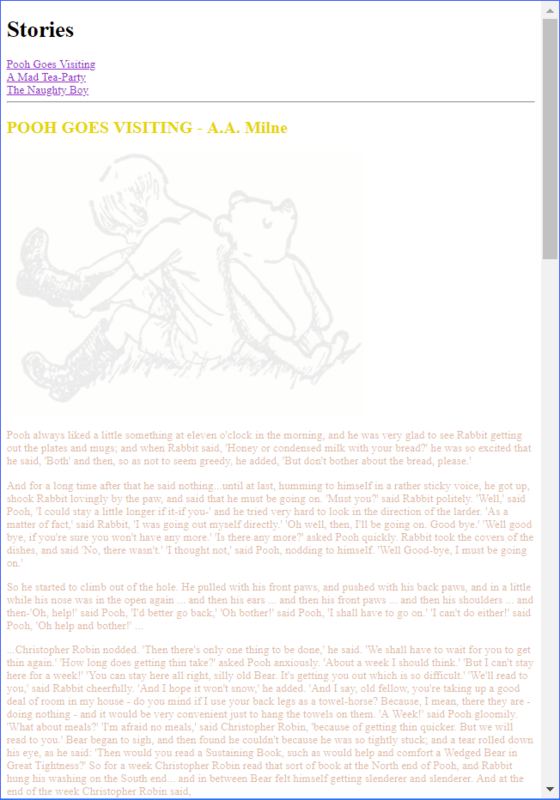 When you are done, open stories.html in your browser. You are welcome to go back to the code and keep working.